I just got this Pace machine. It has an interesting feature called a "4th reel Jumbo Jak"
From what I see on mine, it doesn't connect to any pay-out mechanism... must have just been a hand-pay bonus. I am curious to know any history of this feature. Looking at it, I think it may have been something added on by operators, and may not have been a factory piece. I saw a machine about a year ago that had the window and plate on the front, but none of the "jumbo jak" mechanism was present. My 50c machine does not have a jackpot mech, but it does have an award token dispenser. I dont have any tokens to test it yet... I'll order some from Dave the next time I place an order. Is the fourth reel listed on the payout card? What symbols are on that reel? The 4th reel is not listed on the payout card. The PACE symbol also has a notch in the reel behind it to detect that position with a finger, similar to the notch in the back of discs that detect for an award token hit. you can see the finger that detects the bar symbol in the pic. but there is no linkage connected to it. The regular jackpot on this machine dispenses a token, but I think if you were to hit the 4th symbol at the same time, it was a hand-pay bonus. This Pace machine is a rare one. I have one in a nickel denomination. I've also seen it in a dollar. There should be a special marque on the top of the machine. I"ll attach some pics, not the greatest quality. The dollar machine belonged to Allan Sax. His was really special, it had plexiglass sides. I don't remember the story on where he picked it up. I sent him my original marque so that he could copy it for his machine. 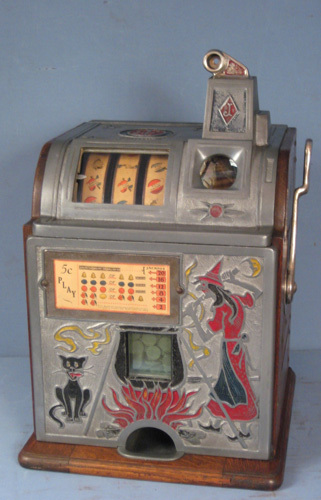 That 4th reel shows in the little hole where the "call attendant" button was used in casinos. Found this pic of marque too. Your marquee shows PACE MANUFACTURING CO, which means it was probably an option done at the factory by PACE. looks like it was mounted to the back door. my machine doesn't have any holes in the back door. either not all machines had the marquee or my back door was swapped-out at some point.